Yep, those are the methods you want to use but I was getting at what objects you want to use them on and how they relate to each other. I may have jumped the gun a bit, I thought you were implementing stacked spins but it looks like you are starting from a collision model first. Carry on and if my advice makes sense at some point, then you are probably ready to use it. Airman wrote: Larger charged particles cannot be formed without photons from the charge field. I would be a bit more precise and say that larger particles, even electrons and protons, can be formed just by collision but we would not call them electrons or protons unless they were radiating charge, which then requires a charge field. The collisions to add spins do not require a charge field. They could be individual collisions over a short or long time span. This might be quibbling, since there is a charge field, but it isn't strictly needed to stack spins but is absolutely needed for charge emission. Lloyd wrote. How much of this is believable? Spoiler alert. It starts slow, solid cylinders always roll faster than hollow ones, regardless of the radius. The professor, Manuel Tamez(? ), has a fine lecture series. Precession is due to an external torque applied to a spinning body. For the first time I easily followed how gravity causes a torque which results in the spin axis precession toward the direction of the torque. Increasing the weight increases the torque and increases the rate of precession. If we apply the torque, instead of relying on gravity, we find that stopping the torque stops the precession. The professor has good demonstrations. I’m not at all certain precession is applicable to photon collisions – very short duration torques? I've got to wonder. Would the X1 be initiated at right angle to the angular moment? Absolutely the charge field is involved. Along the same line as why airplanes can fly, as they move faster they encounter more of the charge field, enough to counteract gravity. As a gyroscope is spinning, it can intercept more of the charge field, while gravity remains the same; the result is spinning gyroscopes in motion do weigh less. I’m far from understanding how else the charge field is involved – Is it possible the photon/anti-photon ratio result in the right hand rule of precession? Would the precession rate vary from say Earth to Venus? I don't think precession requires a charge field because precession is needed before a charge field has been created. What I think you might be missing is that photon collisions happen in a vacuum but all of these videos are within a dense charge field, and an atmosphere, which provide drag to the precession after the torque is removed. Photons don't have any such thing to slow them down. They are also colliding at tremendous speeds, so there is a lot more energy involved, so short duration torques have more of an effect. Also, a spinning sphere (gyroscope) does not intercept any more of the charge field than if it was not spinning. It doesn't take up any more room when it is spinning. Other shapes can do that, but not a sphere. Airman: The individual B-photons drive the formation of the X,Y and Z spin group, which are fleshed out with the many photons that will then lead to formation of the next A spin. Airman, thanks for the gyroscope stuff. I'm practically certain that there can only be one A-spin. The next spin after the Z-spin is the X2-spin. Si? Miles knew this initially, but then he seems to have forgotten. He had said in an early paper that there can only be one axial spin and I told him I think there can be any number of spins. Like I can throw a football spinning on its long axis (a "spiral"), or I can spin it on both its long axis and its short axis, causing it to turn end over end. He then pointed out that the spin about the short axis is only an end over end turning of the long axis; the short axis is not a physical axis of the football, just an axis of the spin. Nevyn: The collisions to add spins do not require a charge field. They could be individual collisions over a short or long time span. This might be quibbling, since there is a charge field, but it isn't strictly needed to stack spins but is absolutely needed for charge emission. I think about the only place there can be such spin-stacking collisions is within a very dense liquid or gas/plasma, like a star, where there's lots of charge flying around at very close quarters. Right? When a scientist takes a photo of a spectrum of the Sun, how many photons does it take to make the spectrum? If emission or absorption lines show up, do they only appear on high shutter-speed photos? Or are they visible to the eye, with or without a magnifying glass? I just checked Miles' papers and see he discussed spectra at http://milesmathis.com/stark.pdf . He said this there. Charge is real photons in the field. These photons produce little streams through and around the nucleus, which I call charge channeling. In dozens of previous papers I have shown you how to map this field through a large number of elements and molecules, drawing the diagrams that explain how and why the nucleus channels as it does. In most cases, charge stays in the infrared, since what we call heat is actually the charge field. But elements (and free electrons) can also spin up these photons into the visible and beyond, giving us visible and invisible emission lines. Since each element channels in a different way, each element will also produce signature emission lines. ... Pole electrons are positioned in an external charge eddy, where they are vulnerable to ambient charge. ... What happens in the Start Effect is that an electrical field coming from the side pushes the electron over a tiny amount, causing a wobble in that circle [around the pole]. ... My pole electron is only one or two electrons distant from the nucleus, and it is caught in a powerful and real stream of photons. I have already done the math showing the distance of the valence electron.... In my theory, the electron is in a vortex, and that vortex is a real field of real particles. ... Once you have this nutation in the polar vortex, caused by the electron, you will naturally have a shift in photons being emitted through that vortex. It is like shifting the center of focus of a light. That is one cause of the shift, but what gives us the split? Well, this is a little more complex.... Yes, if the photons we are monitoring are above the infrared, then the gas has to be spinning them up into the visible or ultraviolet; but otherwise we don't have to explain the creation of photons. All we have to explain is the spectrum or series at a given energy. ... I only have one electron in Hydrogen to work with. Yes, but Hydrogen isn't the only thing present in these experiments. We also have the field, which is also real. The field also contains photons and electrons. It is these electrons in the field we will use to explain the series, not the electron in Hydrogen. ... I am letting electrons recycle photons. ... And the photons it is recycling are dependent on its own energy. This energy of the electron is determined by both its linear speed and its spin speed. A greater spin speed will let it “open up at the pole” to allow more energetic photons to recycle through it. ... Why would there be levels in the field around a Hydrogen atom, if there aren't any electron orbitals? There are levels simply due to feedback or resonance between Hydrogen atoms and the ambient field. ... The Hydrogen series fall off in a distinct pattern ... because, again, we are seeing the fall-off with distance from the gas or other substance (or from the point of heating). ... As the emission travels from substance to eye or machine, we have a fall-off in temperature. That fall-off in temperature is the same as a drop in energy in the ambient field, which is the same as a less dense E/M field. In other words, the pattern of free electrons in the ambient field widens. ... The lines are representing not a fall-off in distance from the nucleus, but a fall-off in distance from the gas as a whole. Does anyone want to make an illustration or simulation of that so I can understand it? PS, I forgot to mention that it seems that gyros must behave differently in space than on Earth, at least regarding precession. If you put the axis of a gyro on a fulcrum in space, I assume that the fulcrum would have no effect and would not really act as a fulcrum without gravity having its normal effect as on Earth or other body. But experiments should probably be carried out on the ISS with gyros and fulcrums, to make sure. It could be that contact with mass may have some effect, like stacked spins seem to have. Lloyd wrote: I think about the only place there can be such spin-stacking collisions is within a very dense liquid or gas/plasma, like a star, where there's lots of charge flying around at very close quarters. Right? A dense liquid or gas is more likely to cause spin-ups/downs, as in it will have a higher rate of spin-conversion, simply because there is more to collide with and it is harder to avoid those collisions. However, there is nothing to say that spin-conversion has to happen on a short time scale. It makes it much easier for us extremely short-lived entities to measure it, but it is not a requirement. It is also very difficult for us to follow a single photon around to observe its life and if we could, then we would have to control that photon to keep it in our own vicinity which would corrupt the observations. At the end of the day, a spin-conversion only requires the right collision. To reach an electron, say, from a BPhoton it might take about 30 collisions (assuming they all spin-up and no down spins and I don't know the exact number but it would be somewhere between 20 and 40 I believe). Those collisions could be separated by a million years each or it could be nano-seconds. Time doesn't really matter, just what the particle is. Lloyd wrote: When a scientist takes a photo of a spectrum of the Sun, how many photons does it take to make the spectrum? A spectrum is a range of possible values. Those values may be quantised or not. Our measuring devices have their own resolution which is the result of their accuracy and precision. Accuracy is the ability to hit a specific target. Precision is the ability to measure that target. These concepts are often inter-changed but they are quite different. You can be accurate but not precise and you can be precise but not accurate. Ideally, we try to build machines that are both accurate and precise, but it is not always possible. Maybe an example might help here. Suppose you are an archer shooting arrows at a target. The target is separated into circles that are 2cm wide (inner to outer radius). You want to hit the bulls-eye, obviously. Accuracy is your ability to put an arrow where you want it to go, i.e. the bulls-eye. Precision is the width of your arrow heads. If the arrow head is 10cm wide, then it is much easier to hit the bulls-eye because even when your accuracy is off, there is a wide area covered by the arrow head so it is still likely to cover the bulls-eye. However, if you were trying to measure the width of each circle with your arrows, then a large arrow head is not very useful because it has that wide area so you can't get good readings. You want a small arrow head, say 1mm, so that you can differentiate between different arrow hits. So, how many photons does it take to cover the spectrum? It depends on the precision of the device used to measure them. There is some absolute number of photons, since they are quantised, that make up the absolute spectrum, but I don't know what it is. It is something that I have wanted to work on. To make a close study of the E/M spectrum and how that relates to stacked spins, but I haven't gotten around to it yet. You could look at the current E/M spectrum and note the number of individual wavelengths, that will be close to your answer. Lloyd wrote: If emission or absorption lines show up, do they only appear on high shutter-speed photos? Or are they visible to the eye, with or without a magnifying glass? Emission and absorption lines can not be seen with the naked eye, even with a magnifying glass (assuming you mean measuring photons directly with these devices). They require great precision because they are extremely tiny. Shutter speed doesn't really come into it. Shutter speed is the time it takes to create a measurement and that depends on how many photons are present. If there are a lot, then you can use a high shutter speed but if there are not very many of them, then you need a long shutter speed. Just like normal photography. There may be some limits, as the longer the shutter speed the greater the chance of other photons (from other sources) being captured that could smear out those lines. Conversely, you can't make it too short either or you will not measure anything. We can do the same thing in audio but instead of seeing the absorption lines, we hear them as higher or lower volume. This is what an equalizer does. Imagine you had a graphic equalizer with lots and lots of individual frequency bands. So many bands that you could isolate individual frequencies (which would be about 20000 of them to have 1Hz precision). To do this we use what is called a Notch Filter. A filter so precise that it only limits a single frequency (+/- a few Hz since the surrounding frequencies are also affected but not by as much, it rolls off, not a sharp drop like a cliff, but close compared to other filter topologies). Let's say we left all filters at the zero point (so no filtering) but we move the 500Hz filter down to its lowest setting (so filtering as much as possible). Now, any signal we send through that device will have all frequencies at the same volume (assuming they are all the same volume from the source), except the 500Hz signals, which will be removed, or so low as to be considered removed. That creates an absorption band at 500Hz. If we put all filters at their lowest setting but left the 500Hz filter at the zero point, then we have created an emission line because the only frequency that gets through is 500Hz. So atoms are like little filters. The way charge flows through them causes certain frequencies to be emitted and others to be removed (or lowered considerably, beneath the noise floor). You can change the filter frequencies by using electric fields on the atoms which, Miles has stated, moves the electrons over a bit and changes the flow of charge through the nucleus. This could also be related to why the mainstream think that electrons emit photons when they change energy levels. It might actually be the electrons shifting around inside the nucleus which causes a quick flash of a different frequency. Pure conjecture on my behalf, but it seems reasonable. The Stark Effect paper is a really good one. A bit hard to penetrate, but really important and worth studying closely. I have thought about animating it, because it is so important and it seems relatively easy enough to do. Still haven't put any time into it though. So many ideas and so little time to work with them. Perhaps Jared might like to tackle this one. I am happy to help when needed. Lloyd wrote: PS, I forgot to mention that it seems that gyros must behave differently in space than on Earth, at least regarding precession. If you put the axis of a gyro on a fulcrum in space, I assume that the fulcrum would have no effect and would not really act as a fulcrum without gravity having its normal effect as on Earth or other body. But experiments should probably be carried out on the ISS with gyros and fulcrums, to make sure. It could be that contact with mass may have some effect, like stacked spins seem to have. The fulcrum is just a large mass with respect to the gyro. It is something for the precession to work against. On the Earth, the fulcrum is just an extension of the Earth itself. So, yes, in space things will be different because we don't have such a large mass to work with. However, they are attached to the ship, so they do have mass to work as a fulcrum. Gravity Probe B was based on gyroscopes so I'm pretty sure they have a decent idea on how they operate in space. I'm not sure how gravity comes into it. Gravity often comes up when talking about gyro's because they defy it. That doesn't mean that they require it to precess. I'm not saying one way or the other, but I haven't seen any definitive evidence that gravity is required. Thanks for chiming in some more here, guys. I was kinda lost in our train of thought (not derailed, just absorbing and thinking about all these various things. So I'll give this Stark Effect a shot with my newer, particle-only based model (no animation tricks, just particles, spin, and collisions) and see what I can come up with. I'll have to re-read the paper of course but that's always a pleasure. I'll make a new thread about that and give it a "spin" tonight. Nevyn wrote: This could also be related to why the mainstream think that electrons emit photons when they change energy levels. It might actually be the electrons shifting around inside the nucleus which causes a quick flash of a different frequency. Pure conjecture on my behalf, but it seems reasonable. I think this is true, and we see this in "beta decay" and other processes as well. I often wondered how they would measure that single photon coming out, that is to say how would they know it was just one, if any others were moving in a direction away from their detectors? It seems obvious they couldn't be that precise. They aren't even precise enough to admit that photons exist in the first place as real particles, so it's always been highly suspect to me since reading Mathis's work. It seems reasonable to me, that a wobbly electron would cause a different charge emission from an atom than a more stable electron. I'll try to incorporate that into my animation. I don't hear any agreement. Ok, please consider this. All things are made of real photons with mass, radius and spin. The only interaction is through photon collisions. There’s something else, I don’t recall reading it explicitly, although it must be true, photons are the source of gravity. That is, the photon radius is expanding at the rate of gravity. Photons do not have an emission field to prevent contact. If two photons came together without sufficient force to separate, they could remain in sustained contact. Their spins may or may not interfere at photon spin equators, but I can see no reason why photons couldn’t remain in polar contact indefinitely. Any old incoming e=mc^2 photon can easily breakup the photon pair, or replace one of the two partners. No reason photons couldn’t become members of the B-photon x,y,z spin loops or just recycle through the charged particle. Photon gravity helps in the creation of larger charged particles. Since the tangential velocity of the surface of the larger charged particle at its equator is light speed, photon gravity helps establish an equilibrium photon count for the larger charged particle. No, I don't think that is possible. The problem is the photon spins will interact. No matter which way they spin, they can collide with 2c worth of energy. At first, it seems like they could be spinning the same way and not collide. Without gravity, that would be true. However, gravity makes them appear to move together so their VOIs will intersect which means their actual BPhotons can collide. If their spin cycles are coherent, then they can survive for some time like this (which is still a small amount of time to us) but eventually they will collide. If they are spinning opposite to each other then they will collide much sooner. This is probably the reason light beams lose focus and density as they travel. On a re-read I noticed that you said polar contact and this is true to a certain extent. I was assuming side-by-side but front-to-back is a bit easier. However, now you are creating a line of photons, not a sphere. I'm not sure what you are trying to get at here. Why do we want them in a line? Why do we want to group them at all? How about simulating two A-spin photons gyroscoping around each other? And can we calculate how long they could remain joined together? Can the vectors be diagrammed easily, if at all? LloydK wrote: How about simulating two A-spin photons gyroscoping around each other? And can we calculate how long they could remain joined together? Can the vectors be diagrammed easily, if at all? Do you mean two A-spin photons orbiting each other, or revolving around each other? What would cause such a motion? It seems like two A-spin photons could in theory be moving right next to each other in the same direction for a small amount of time, before gravity warps the vector and they either collide or miss each other. But I can't think of any reason they would be orbiting each other, since they're only moving linearly and spinning on the one, lone axis. There's no "wobble" to an A1 photon. Have you guys made any progress with the Stark Effect paper? Just curious. No progress here, alas. I'm finding it ultimately difficult to script or program anything we want to do with my tools, despite their internal power. Maya can do anything, I just lack the ability to tell it how. I've been re-re-reading the Stark Effect paper and a few other related ones as a result of your question though, and it's nice. Missed some things the first few times on those. Also very interesting is his most recent paper on the Electron, which might be pretty helpful. At this point it feels like all I can do is diagram things. I was hoping to physically simulate these concepts, but I just can't wrap my head around how to do it without an even heftier array of computers. I'm running 34 cores in my attempts and still falling up short, and I think it's because I'm trying to pinpoint and simulate every photon, instead of just describe the charge field. So I'm going to start over and see if I can get anywhere, by just describing the field and not worrying about the particles (photons) themselves for now. Working up an electricity vs. magnetism video-diagram next, to see if I can get anywhere. It feels promising. None here, either. I'd forgotten about it, to be honest. I haven't done any work in physics for months (I need a break every now and again). Now that Miles is writing about physics again, it will probably get me thinking along those lines at some point. Jared, I see your starting to see my side of things. It is a real pain, isn't it? You want to develop at the photon level but the numbers required are staggering. But if you abstract it a bit, you lose something in the translation. Of course, you have to abstract it to make progress and then you might be able to see how to unwind that abstraction at a later point. Still, that's half the fun of this work. I was re-reading a paper about this stacked spins matter. This one: http://milesmathis.com/super.html . I wonder if in the various simulators you are creating you are giving true freedom to the photon. I mean, the travel direction, the axis spin, the first stacked spin etc. should all be independent. If we have the axis spin about x, the first stacked spin could be about any line touching the “original” B-photon, not necessarily about z or y. Yes, I have thought about this and, to a certain extent, have incorporated those types of ideas. The ones I haven't are because they introduce great complexity. For example, given a stacked X spin, it is possible to stack a Y or Z spin on top of that, but I don't program that in because it just creates confusion at this stage. In a fully implemented simulator I would do that, because I would have the math to back it up (still working on that). In fact, I wouldn't actually need to do it, it would just happen. I would have to take great pains to limit it to the X, Y, Z order (which I obviously wouldn't do). However, things are not quite as free as they seem. For instance, given a BPhoton with no spin, the first thing it has to do is gain an axial spin. This can be about any axis. Once it has that axial spin though, the next spins are not free to go about any axis they want to. The next spin must be on an orthogonal axis to the axial spin axis, so we have already lost one axis of freedom. Every stacked spin level is the same. They only have a choice of 2 axes because they have to be orthogonal to the existing spin axis they are stacking on top of. While I haven't figured it all out yet, it also seems to me that there is a limit to the direction of the linear velocity. I think it must be pointing in the same direction as the top level spin axis. This makes the top level spin rotate around the linear velocity. I can't give you any good reasons for that, but my intuition is pointing me in that direction. Any other combination of linear velocity and top level spin just doesn't look right (I'm sure that's a scientific argument ). In essence, they are not all free in the true sense of the word. Properties of the photon effect each other and can place restrictions on each other and on new spin levels. It is still good to bring these things up every now and again though. Sometimes I forget about some things while working hard on others so a reminder is not a bad thing at all. It also shows your own level of understanding growing. It takes a fair bit of time thinking about stacked spins before you see how the different parts effect each other or even to just realise that they may or may not. Nevyn wrote: They only have a choice of 2 axes because they have to be orthogonal to the existing spin axis they are stacking on top of. Why? And what happens with collisions that are not precisely on those axis? I'm talking about this freedom because, starting from the paper I linked 2 posts ago, we only have a "spin influence", and a stacked spin beyond that. The main reason the stacked spin was proposed by Mathis is because it's the most reasonable way to have more than one independent spins. Moreover, when we construct a stacked spin we have a sphere, not a toroid shape, and that is because (imo) any line tangent to the original particle can be the spin axis of this new particle, regardless of the "inner" spins properties. This sphere is the limit of the stacked spin and this is used to define where the subsequent stacked spin will be (on any tangent on this sphere). The toroid shapes should make you think something is wrong. EDIT: I think a basic spin/stack-1 simulation could be created together with collisions to see if this can go any further. Hi Ciaolo, I'm having a hard time visualizing your description, can you make us an image, maybe do a screen capture or a paint diagram in order to show the tangent lines? You've given me reason to make Chris Wheeler's wave.mov a little more convenient. The shift after the two cycles is due to the fact that the end-over-end spinning sphere is slowly approaching (on average!) the viewer, the view is being reset to the original location. The torus we've discussed is described by the e-o-e sphere motion within the spherical volume shown, that spherical volume doesn't exist. Because the new stacked spin must be orthogonal to the existing spin. This means that they are not independent. They have a relationship. They also have another relationship with respect to their rotation speeds. You can read more about that in my paper at https://www.nevyns-lab.com/mathis/papers/spin-velocity.html. A collision that is off-axis will not have the required energy to create a new stacked spin level. I imagine that most collisions fall into this category which is why spin-ups and spin-downs are rare except in certain, controlled, circumstances, such as inside of a nucleus where the charge is dense. Ciaolo wrote: I'm talking about this freedom because, starting from the paper I linked 2 posts ago, we only have a "spin influence", and a stacked spin beyond that. The main reason the stacked spin was proposed by Mathis is because it's the most reasonable way to have more than one independent spins. Miles has stated from the start that each spin level is orthogonal to its inner spin. They are not independent but they are still different spins. Ciaolo wrote: Moreover, when we construct a stacked spin we have a sphere, not a toroid shape, and that is because (imo) any line tangent to the original particle can be the spin axis of this new particle, regardless of the "inner" spins properties. This sphere is the limit of the stacked spin and this is used to define where the subsequent stacked spin will be (on any tangent on this sphere). Not any line and it isn't a tangent. It can be any line pointing out from the equator of the existing spin. The equator of a spin level is every line orthogonal to that level's spin axis. Ciaolo wrote: The toroid shapes should make you think something is wrong. Stacked spins produce toroidal shapes, in a general sense, because of the doubling radius. The spinning particle, whether that be an axial spinning BPhoton or any number of spin levels, takes up R space where R is its radius. The next spin level takes that and rotates it around an orthogonal axis which doubles the radius but only in 2 dimensions, not 3. We now have a general shape that is twice as wide as it is high and is circular about the high dimension. Sounds like a toroidal shape to me. Yes, the volume doesn’t exist, it’s the limit of the spin. It’s the body that will spin if there is a spin-up. Nevyn, I’ll carefully read your paper. I’ll also draw something to explain my point, when I have time. Hi all. I’m doing some research into Mathis papers. In this one http://milesmathis.com/strong.html I found this phrase. What does he mean by “interfering gyroscopically”? Mathis wrote: Any simple analysis of spins stacked in this way must show that they are orthogonal to eachother. If the first spin is axial, then the second spin must be end-over-end about an x-axis tangent to the sphere. This is the only way to keep the second spin from interfering with the first gyroscopically (or the first with the second). The third spin must likewise be outside the influence of the inner two, which puts the y-axis tangent to the great sphere of x-spin. It is not only tangent, but orthogonal. The three axes must create the 6 right-angle directions. This explains the relationship of the magnetic field to the electrical field. It also explains the relationship of both fields to the motion of the particle itself, since the flux of both fields will be determined directly by the speed of the particle and its radius, as you see. Ciaolo wrote. What does he (Miles) mean by “interfering gyroscopically”? Airman. Spins must be added orthogonally, at a tangent to the previous spin's great sphere (taking into account your previous comment). My interpretation is in terms of spin boundaries. The particle cannot have internal or external spins colliding into each other. All the particle spins must stack together neatly in a radius doubling progression. Miles uses “gyroscopically” in one other paper Hidden Variables *, where he is also discussing stacked spins. It definitely adds to the discussion. Miles wrote: I have shown http://milesmathis.com/super.html that any spherical particle can have four distinct spins: about a radius, about an x-axis, about a y-axis, and about a z-axis. You will say, “Isn't that one too many? Aren't the radial and x spins the same?” No, they aren't. We have to give the particle a linear motion as well, and when we do that, we see clearly the difference between radial and x spin. 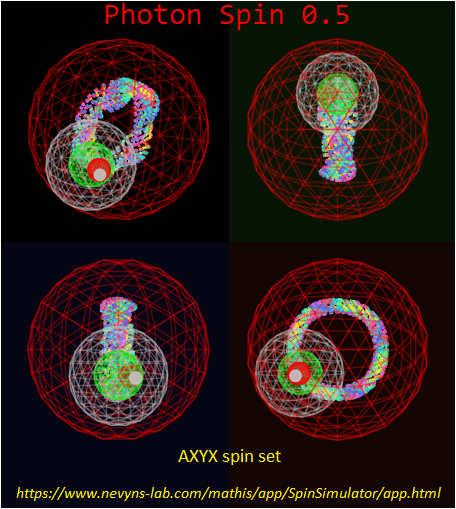 A particle spinning about its own axis is not moving in x,y,z yet, so we have four possible spins. Yes, the radial and the z spin will be similar, but they will not be equivalent, since the z-spin will not be through the axis of the particle. It will be parallel, but not equivalent. And the spins must be of different sizes as well, so as not to interfere with one another gyroscopically. If the radial spin is of size 1, then x will be 2, y will be 4, and z will be 8. This is simply to get the outer spin beyond the influence of the inner spins. 260. Hidden Variables. http://milesmathis.com/hidden.html Explaining the fifth quantum field. 2p. I read all these papers and I think it’s not necessary to draw diagrams since I understand that the 3 spins must be orthogonal, mainly becaus observations say that, but also because all the math, which is correct, is based on this. Anyway, I still don’t understand why a particle with x + y spins will get a new spin about z and not x, since x is orthogonal to the last spin as well as z.
Ciaolo wrote. I read all these papers and I think it’s not necessary to draw diagrams since I understand that the 3 spins must be orthogonal, mainly because observations say that, but also because all the math, which is correct, is based on this. Airman. Miles can describe spin stacking without diagrams, us - not so well. Drawings are necessary to answer your question. Comparing an AXYX to an AXYZ. In the first spin set, I don't believe Nevyn’s spin simulator allows the freedom to make the second X spin at twice the radius of the Y; instead, I un-enabled the simulation's Z and enabled the second X spin; the second X spin is four times the Y radius. 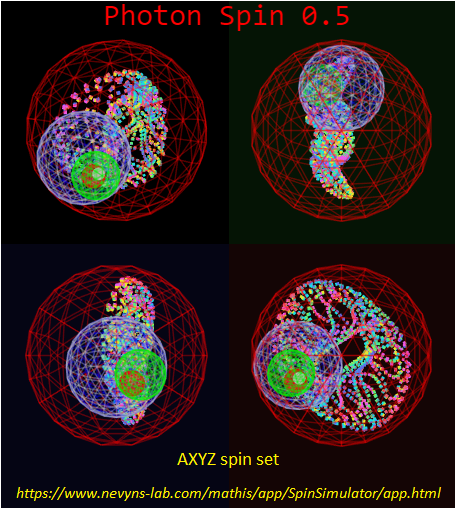 Nevertheless, I believe it’s still fair to say that the AXYX spin set results in an open ring structure when compared to a more voluminous AXYZ. AXYX is lacking emissions in its forward direction, it is more exposed, leaving wider pole openings with no emission protection. AXYX might be described as degenerate, appearing like a large AYX. Welcome David Behlman. I didn't have anything positive to say about Wolfram Math World and offered Martin Gardner instead. I pretty much agree with your comments. We're all trying to understand Miles' ideas here, maybe get a jump on the rest of the world. Feel free to argue. Ciaolo wrote: I read all these papers and I think it’s not necessary to draw diagrams since I understand that the 3 spins must be orthogonal, mainly becaus observations say that, but also because all the math, which is correct, is based on this. It isn't about observations or math, it is about avoiding precession. Or maybe it is about using precession to the extreme that actually stacks on the new spin level. Precession is the force that arises against a force applied to a spinning entity. By doubling the radius, this is avoided and a new spin is allowed to be added. That is Miles' main argument for the doubling radius but in my studies to understand this stuff and why spins might be stacked I thought that maybe the precession is actually what causes the new spin level. Or maybe it is the force left over after the precession force has been overcome by the collision force that creates the new spin level. Either way, precession is the key. You are right that the X axis is also orthogonal to the existing Y spin axis and so it looks like it is feasible to stack a new spin on that axis. This may even happen in reality. However, it creates an unbalanced particle which I think would lose that unstable spin fairly quickly. We don't need any special rules for excluding these types of spins, just a mechanism to explain why they don't survive long.